As a carnivore, I can’t think of many things better than grilled chicken. I’m talking about marinated, moist, fall-off-the-bone chicken. Chickens that were raised cage-free, in a healthy, clean and happy environment. And chickens that didn’t have to travel far to get to your plate. 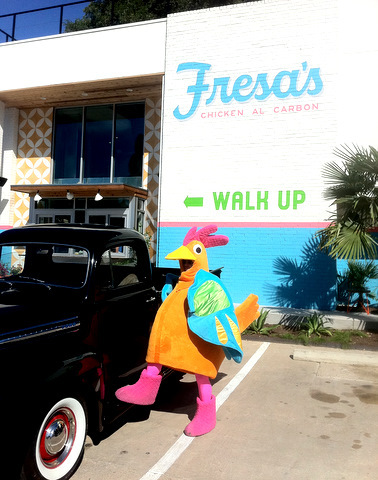 That is what you will find at Fresa’s Chicken al Carbon, a brand new eatery on Lamar and 9th st that just opened this week . The first thing I loved about Fresa’s are the bright, crazy colors that adorn the building. They really get your attention as you drive by – as well as the colorful dancing chicken out front. Fresa’s is set up as a pick up and go kind of place, there are only a few very small tables in the back. My husband and I did eat on the premises, but you are much better off just going through the drive-thru and taking your feast home. Which is perfectly fine – the food here may be fast, but certainly is not “fast food”. The menu is pretty simple. Chicken. Chicken on the bone, chicken on a salad, chicken in a sandwich. They also offer some yummy sides – rice, beans, mexican street corn, potato salad, grilled veggies and fruit. They also have beer (by the 6 pack, perfect for on the go! ), a few wines and aguas frescas – I had the watermelon and it was great. 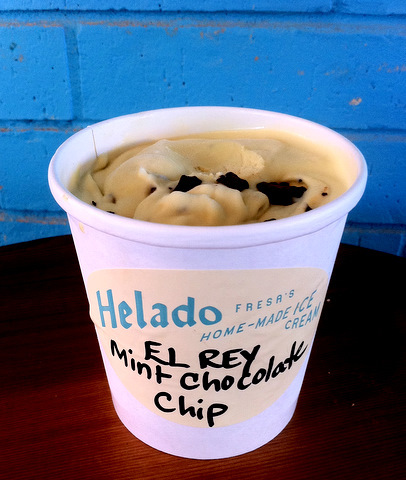 They also make ice cream in-house by the pint – yummy! Fresa’s is a great place to pick up a good, home-cooked meal on the go. I also love knowing that the food I’m eating is from a local farm that has such high standards for the treatment of their animals. And that high standard is something you can taste.